Shop for Computer Science and Programming books. Buy books online from popular sellers like Flipkart.com, Amazon.in or Amazon.com. The books by Cormen or Sedgewick (a standard part of the undergraduate curriculum) are sufficient for this part of the preparation. Google specially, loves to focus on algorithmic questions. A lot of interview questions are re-used and re-cycled by interviews again and again. Chances are, that question you're going to be asked, has been asked a hundred times during the last week, across a number of companies! Google, Facebook, Microsoft, Amazon- all of them frequently ask questions on the lines of those in these books. Questions from Mount Fuji are specially popular with Microsoft recruiters. 4. Good Software Engineering practices. Writing clean and secure code, an awareness about Design Patterns and Object Oriented Programming techniques. Some of these books are frequently recommended by Microsoft recruiters. Take care of buffer overflows! 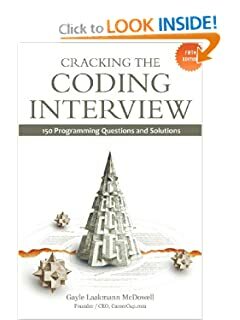 Code Complete is a recommended book for Microsoft Interviews. In case your primary language is C++, make sure you know its "ins-and-outs". You should know about destructors and constructors, virtual destructors, polymorphism, function overloading. Some of these books might help you revise C++. In case your primary language is C, make sure to be well versed with pointers, system calls and how they work. How does Malloc work, how does calloc work? All of these are questions which some interviewers could potentially ask, to test the depth of your knowledge and your understanding of the system "under the hood". Here's a great book for the Java lovers as well. It normally doesn't matter which programming language you know, but make sure to know about it in detail. Given that we live in the age of the Internet, a knowledge of Computer Networks can go a long way. A course on Networks covers a lot of things which we use directly or indirectly, every time we surf the web, send a message or visit a website. Networks are a key component of the information economy. Everyone from Google to Microsoft to Amazon and Facebook is dependent on them. A networking textbook will explain to you, how bits are sent over the wire; the different layers involved; the variety of routing algorithms in use, how traffic congestion is controlled, how networks are kept secure from those with evil intentions. After reading these books (or, after taking a Computer Networking course) you will be able to understand what HTTP, TCP/IP, 802.11, Ethernet and DNS actually mean. Check out these recommended books for studying about Computer Networks (from Amazon.com). Overview of different operating systems, functionalities and charateristics of OS, comparing Windows, Linux. Hardware concepts, CPU states, I/O channels, memory hierarchy. A process, operations on them, process states, concurrent processes, process control block, process context. Windows/UNIX process control, PCB, signals, forks, pipes. Interrupt processing, operating system organisation, OS kernel, dispatcher. Job and processor scheduling, scheduling algorithms, process hierarchies, Problems of concurrent processes, critical sections, mutual exclusion, synchronisation, deadlock. Mutual exclusion, process co-operation, producer and consumer processes. Semaphores: definition, init, wait, signal operations. Deadlock: prevention, detection, avoidance, banker's algorithm. Memory organisation and management, storage allocation. Virtual memory concepts, paging and segmentation, address mapping. Virtual storage management, page replacemant strategies. Popular books for those interested in learning about Operating Systems. Check out these recommended books on Amazon.com. This is typically a compulsory course in many undergrad CS programs. While most traditional engineering branches are based on ideas of continuous domain mathematics and involve calculus; much of Computer Science is based on Discrete Mathematics. A course in Discrete Mathematics typically covers sets, relations, recurrence relations, number theory, groups, fields, permutations and combinations, complexity etc. Here's a quick look at some of the topics often covered in a Discrete Mathematics course. Propositional logic: Syntax and semantics, valid, satisfiable and unsatisfiable formulas, the validity of some logical arguments.Proof Techniques: Forward proof, proof by contradiction, contrapositive proofs, proof of necessity and sufficiency.Sets, relations and functions: Operations on sets, relations and functions, binary relations, partial ordering relations, equivalence relations, principles of mathematical induction. Size of a set: Finite and infinite sets, countable and uncountable sets, Cantor's diagonal argument and the power set theorem, Schröder-Bernstein theorem. Combinatorics: Basic counting techniques: inclusion and exclusion, pigeon-hole principle, permutation, combination, summations. Introduction to recurrence relations and generating functions. Algebraic structures and morphisms : Algebraic structures with one binary operation - semigroups, monoids and groups, congruence relation and quotient structures. Free and cyclic monoids and groups, permutation groups, substructures, normal subgroups. Algebraic structures with two binary operations - rings, integral domains and fields. Boolean algebra and Boolean ring. Graphs and trees: degree, path, cycle, subgraphs, isomorphism, Eulerian and Hamiltonian walks, graph coloring, planar graphs, trees. Here are some recommended books for studying Discrete Mathematics, in case you'd like to take a look at them on Amazon. This is a compulsory part of the curriculum for many Computer Science and Electrical Engineering students. The coure material typically covers DFA (Deterministic Finite Automata), NFA (Non-deterministic finite automata), Regular Expressions, Parsing, Context-Free-Grammars and Complexity classes. Understanding Automata is mandatory for someone who'd be interested in implementing programming languages (Compilers, Interpreters). Lexical Analysis, Parsing, developing the grammar: all of these stages in Compiler Design are based on principles of Automata. Here are a few popular book recommendations for Automata, in case you'd be interested in taking a look at them on Amazon.com.